MK Ben Eliezer charges government responsible for illegal immigration crisis; Minister Livnat: you sat in this government for 2 years! The Knesset overwhelmingly rejected two no confidence motions filed by the opposition citing the Netanyahu government's "failure in political, economic and social" matters. One no confidence motion was jointly put forward by the Arab parties, while Labor and Meretz put forward a separate – albeit nearly identical – motion. MK Benjamin Ben Eliezer (Labor) introduced the Labor-Meretz motion with a fusillade of criticism for Likud and nationalist MKs who spoke at a rally in the south Tel Aviv neighborhood of HaTikva demanding immigration enforcement. Referencing his own family's experiences in Iraq before his family immigrated to Israel when he was 14, "They also called us a cancer! A Jew cannot say this! The Jewish state is a human state!" 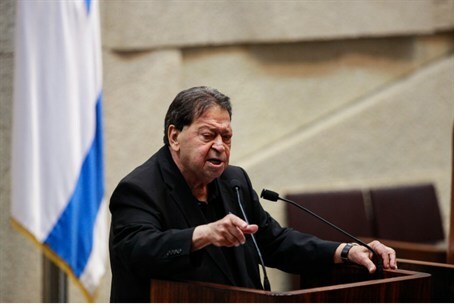 At the same time – like other left wing leaders – Ben Eliezer has been forced to acknowledge Israel faces what Prime Minister Binyamin Netanyahu has termed a “national catastrophe” due to illegal immigration. "I know the pain of the residents of southern Tel Aviv. But whose fault is the trouble they face if not the government's fault? !” he demanded. "Why have we allowed these problems to gestate in these neighborhoods? Why have we not found solutions to return things to normal? I am not in favor of absorbing 60,000 Sudanese, but I experienced terrible things as a child and will not tolerate them in my Israel,” Ben Eliezer said. He concluded, "No one may call another human being a cancer!" Minister Limor Livnat responded on behalf of the government, telling Ben Eliezer he was also responsible for the illegal immigration crisis in Israel. "If a stranger had entered the Knesset today he would have guessed that you still sat in the government as members," she told him. "You sat in this government and participated in forming its policies for two years, which is two thirds of its current duration." "This is a serious phenomenon and, as you well know, the Prime Minister has given clear guidance to lawmakers on what is and is not acceptable," she added. "The Sinai border fence will be completed by the end of the year, probably before," Livnat said, adding. "And other measures are being undertaken." "However," Netanyahu said in reference to violence that erupted following a rally demanding deportations begin. "I would like to make it clear that there is no place for either the expressions or the actions that we witnessed last night." During the rally, MK Danny Danon – who chairs the Knesset committee tasked with preventing illegal immigration to Israel – declared to the over 1,000 attendees "The state of Israel is at war with an enemy state that has formed within Israel and has its capital in southern Tel Aviv!" MK Miri Regev – referring to rising violence in south Tel Aviv where some 100,000 illegal aliens now live – told those assembled that lawmakers would not allow "the cancer" of illegal immigration to spread in Israel.